September 11th, the day the World Trade Center and the Pentagon were pummeled by aircrafts-turned-missiles, changed America forever, the analysts tell us. The shock of seeing a plot (once thought unthinkable, even in movies in which Arabs are usually the terrorists) unravel on live television or from an office or apartment window, now means that life in America will never be the same again. And those analysts are absolutely right: even as the nation goes to war, other, more subtle changes make themselves apparent in our everyday lives. Yes, some things in America have changed. But other things haven't changed a bit. Racial profiling - the esteemed pastime of some of the nation's toughest cops - has reached out beyond the Black- and Latin-American communities to target Arab-, Muslim-, and South Asian-Americans as well. A good friend of mine, a male in his late twenties, with olive skin and dark hair (and an Arab name to complete the getup), rented a car in Pittsburgh to visit his brother in Philadelphia, one week after the tragedy occurred. The employees at the rental agency chatted politely with him, but called the police five minutes after he left. Within an impressive span of twenty minutes, four police cars had flagged him down on the highway, their sirens blaring and their lights flashing brighter than a fireworks extravaganza. They searched him and his car and, finding nothing incriminating beyond his olive skin, they issued him a speeding ticket. Needless to say, he'd been driving well within the limit. I wasn't upset to learn that the cops had chased after him. After all, they had received a tip about a "suspicious-looking man" trying to rent a car. I felt angry, as I'm sure my friend did, that being an Arab makes one "suspicious," because it seems that we Arabs, Afghanis, Pakistanis, Indians (and anyone else who looks "suspicious") are the ones most in need of protection. If you need any evidence of this, simply skim through the archives of any major newspaper in the weeks following the September 11th attacks. In Huntington, New York, a 75-year-old man tried to run over a Pakistani woman in the parking lot of a shopping mall. She sought refuge in a store, but he followed her in and threatened her with violence for, as he said, "destroying my country." Furthermore, as of September 21st (ten days after the attacks), 250 hate crimes had been reported on college campuses alone throughout the country. The most horrifying news of the backlash occurred the first weekend after the attacks, when Balbir Singh Sodhi, a Sikh-American who wore the traditional turban, was shot point-blank and killed at his own gas station by a misguided "patriot." The murder occurred in Mesa, Arizona, and was followed by another murder in Dallas, Texas, of Waqar Hasan, a Pakistani grocer, a few days later. The other incidents of hate crimes against Arabs and Muslims (and anyone unfortunate enough to resemble them in the narrow halls of some minds) are too numerous to list exhaustively here, and it would be a futile attempt anyway, since many victims hesitate to report them. The hesitation results from fear that the authorities will show no sympathy, and skepticism that they will be adequately protected. 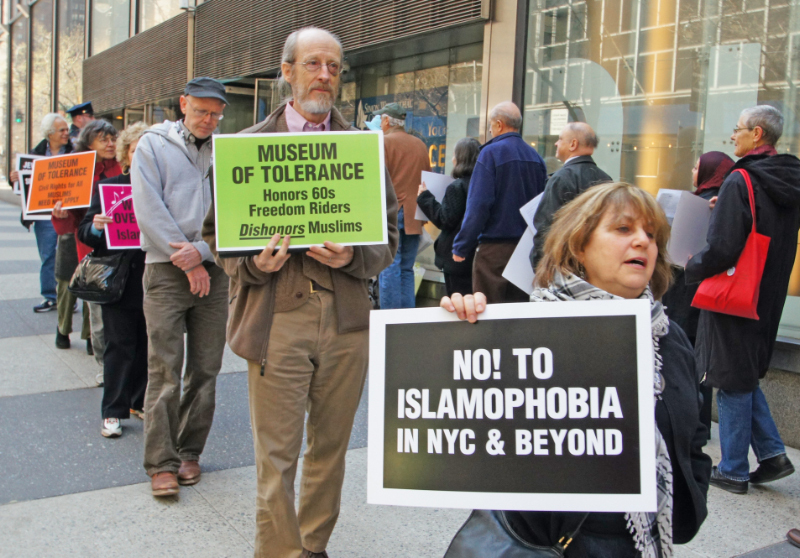 Of course, New York mayor Rudy Giuliani (as well as President Bush) made a point of emphasizing that Arab- and Muslim-Americans should not be targeted in any way; they argued it was actually un-American to participate in a backlash of any sort. But, sadly, my first reaction to Giuliani's statement was that the New York mayor hadn't even been able to protect his African-American citizens from his own police force. The horrible story of Abner Louima and the killing of Amadou Diallou surged to the immediate surface of my mind. If this can happen to other immigrants and to people of color at the hands of the police themselves, what would be the fate of the Arab and Muslim community in New York? Good to his word, Giuliani did provide extra security at mosques, Arab- and Muslim-owned businesses, and ethnic centers. But that act did not halt the wave of crimes in New York and across the nation, even around the globe, as evidenced by the stoning of a school bus of Muslim children in Australia. What is the source at which all this hatred is tapped? Could it simply be that the targets of these crimes resemble Osama bin Laden in physical appearance, religion, or ethnic origin? No, as many members of other minority groups in this country will tell you, the intolerance of certain groups of people is deeply embedded in the American psyche - it is a stain on the fabric of our society, a stain that has not been bleached out, but rather one that has been acknowledged, thus ignored, thus accepted as a charming oddity of the fabric's design-which poses an even more vexing problem, the general, national pretense of tolerance. How quickly this veil was swept away. Of course, many will say, "But CNN did dozens of segments about the backlash against Arab-Americans. And George Bush even visited a mosque!" The first claim is partially correct; yes, CNN and many other media did a "bite" or took a quick look - though rarely an in-depth examination - of the fierce tsunami of anger and hatred that hit the Arab- and Muslim-American community. However, these seemingly altruistic appeals for understanding were neatly compartmentalized and then isolated from other coverage of the events; thus, it was not rare that a CNN anchor would shake his or her head at the sheer "un-Americanness" of vandalizing a mosque or spitting on a veiled woman, but in the next interview segment pose a question to a military officer or a political science guru to the effect of, "Don't these people believe that dying for God is the best way to get their 70 virgins in heaven?" Likewise, George Bush stood in his stockinged feet between the ornately decorated walls of a mosque and said, in his direct and simple manner, "Islam is peace." The effort meant a lot to many Muslims, but his speech on the White House lawn the day before had referred to the U.S. military retaliation as a "crusade." And he spoke clearly about punishing any nation that harbors terrorists, which has catapulted the much-beleaguered, innocent people of Afghanistan into a catastrophic refuge crisis. Bush also spoke plainly about the secrecy of many governmental operations, which will probably result in phone tappings and a general invasion of privacy on the part of many in the Arab and Muslim community. That is the dualism of the media coverage and government's current attitude towards Arab- and Muslim-Americans. Perhaps this community is surprised and disappointed; and why should anyone who belongs to this community be surprised? We have long been accustomed to this intolerance-it's just out in the open now. For example, after the Gulf War, I had learned to keep quiet about my "heritage" and my Middle Eastern culture. Even though I am a Christian, I found myself studying and reading about Islam in order to defend my fellow Arab friends. I regularly had to correct people's assumptions that Allah was a God separate from the God of Judaism and Christianity. I had to clarify that, yes, Muhammad had allowed each man four wives, but to explain that the phrasing of that allowance made it impossible for any man to love four women in exactly the same way, and, besides, nobody took multiple wives anymore. And, of course, the hijab question (a popular one from my feminist friends): why did "all those poor women" in the Middle East "have to" veil themselves? It was "unfair" and "a clear sign" of the oppression of women at the hands of Islam, but never a question of whether or not "those women" chose to veil themselves as a sign of their faith, much as a Christian woman would wear a crucifix around her neck, a Catholic nun a habit, or a Jewish man a yarmulke. I really had my work cut out for me. Again, I am an Arab Christian, but I was the only Middle Easterner that many people knew. And while I was happy to talk about a lot of these issues, in the days during and after the Gulf War when these issues were "hot," at times my frustration climaxed and I felt like snapping, "Why don't you go read the Qur'an yourself, or ask someone who's actually Muslim? I can't be the only Arab you know!" This is the sort of pretense I am talking about, the same kind that nods approvingly in support of Black History Month, but moves to acquit four white police officers of killing a young black man in the doorway of his New York apartment building; the kind that smiles encouragingly at the "Latin revolution" of singers like Ricky Martin and Jennifer Lopez, but refuses to really change even when Latin-Americans are forced to stage "brownouts" of the entertainment industry. If America wants truly to accept the "other" and incorporate them into the "self" ("American" culture), then a lot of things will simply have to change - really change. It's that pesky "c" word that strikes fear into the hearts of many. And why are we so afraid of "real" social change anyway? I should add that many segments (usually isolated pockets) of the American population have changed. I have witnessed this myself over the years. For example, many co-workers, friends, and neighbors have, throughout the years, showed a genuine interest in my culture - in the food, the language, the dress, the geography, and especially the politics. After the tragedy of September 11th, these people's letters flooded my email inbox; alarmed by news reports of hate crimes, these friends expressed their concern for the safety and well-being of my family. The seemingly endless receipt of these emails, some from people I hadn't spoken to in years, accompanied by phone calls from many others, made me sign in relief - and smile at the great, though rare feeling that acceptance can inspire in a lonely person's world. For it is truly lonely being an Arab-American in these dark days. As the nation mourns, we desperately want to mourn as well, though we are viewed as the "bad guy" no longer only in Hollywood blockbuster flicks, but in everyday life as well.